When you combine your active reading with note taking, you'll be even more effective in remembering what you've read. Your notes will provide substance for your assignment, and because you've already paraphrased the information from the text, you'll avoid plagiarism. Explore the tabs below for effective note taking strategies. How do you ensure you don't miss any important points in a lecture? What is the best way to take and review notes? 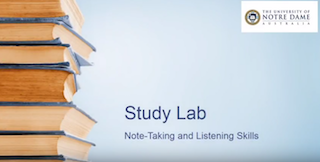 Watch this video to learn about effective note taking systems and listening techniques. Have a separate notebook for each unit you are studying. Avoid looking at the original text when you summarise or paraphrase the ideas in your own words. Always acknowledge the author at the end of the quote, paraphrase or summary. Identify and select – not everything is important. When reading through material, look for keywords, phrases, reasons and details. Do not write word for word – summarise ideas and concepts using bullet points, short phrases, flow charts, concept maps, and diagrams. Use abbreviations and symbols to reduce your notes. Symbols like arrows can be used as a quick way to indicate relationships. Use colour – it will bring your notes to life and draw your attention to important concepts. When highlighting, use it sparingly. If you highlight too much, it defeats the point of highlighting! Review notes regularly and briefly before your next lecture. See the link below for examples of how to structure your notes using this method. Mind mapping is the graphical representation of notes. The idea is that you can capture a lot of information without using too many words, as images are easier to remember. Mind mapping requires that you see the bigger picture in order to make connections between facts, ideas, and details of the topic. It is the process of creating the mind-map that makes it an effective method because it requires your active participation, improves your concentration, and sharpens your critical thinking abilities. The main keywords or themes in a topic go in the centre, with related concepts branching off. For an example, click on the image below. 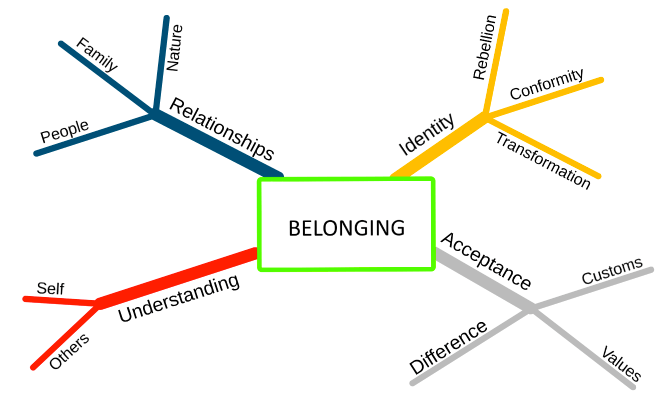 We see that the tricky concept of "belonging" is linked to the ideas identity, relationships, acceptance and understanding. The map also includes opposing concepts such as rebellion and difference. Provides guidance on how to get started with mind mapping and a detailed mind map example.